Fish live in a three-dimensional environment. 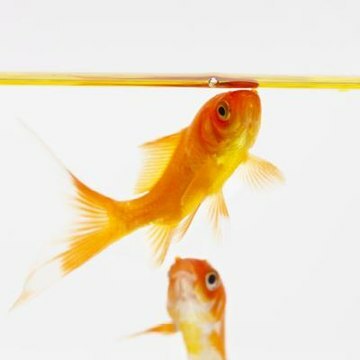 Instead of just worrying about moving forward, backward and to the sides, fish must also think about moving up and down. This typically requires a change in buoyancy; many fish have the ability to make themselves lighter to float up or heavier to sink down by using a swim bladder. For a fish to be buoyant, or float, it must displace less water or the same amount of water as its own body mass. This isn't easy in an underwater environment where the density of the water changes with the depths and different currents. Many fish use swim bladders to help them with quick depth changes. These bladders fill with air to help fish rise or release air so fish can sink, often in conjunction with forward movement. Some fish, however, don't have swim bladders. These fish typically use continuous forward movement along with angled pectoral fins to stay afloat. When you see fish swim to the surface and open their mouths to gulp air, many aren't breathing that air; they likely still breathe through their gills. Instead, these fish are filling their swim bladders with air to help maintain buoyancy. These swim bladders are open, meaning there is a direct line from the mouth to the swim bladder. Fish with open swim bladders, typically freshwater fish, tend to live in shallow water or within a few feet of the surface to allow easy access to the air. Closed swim bladders are more efficient for fish that prefer to live deeper underwater. Instead of having a tube from the mouth to the swim bladder, these fish have closed swim bladders that pull air out of connected blood vessels to stay buoyant at lower depths or to rise quickly. To sink, the closed swim bladders release air back into the circulatory system. The air in this system comes from the gills, so it is constantly being replenished to be available when the swim bladder needs it. Bony fish, or the ones with hard bones similar to those of land vertebrates, typically have swim bladders. Fish with skeletons made of cartilage, such as sharks, often use another system to maintain buoyancy. Their skeleton is lighter than that of bony fish, and they carry oil in their livers; oil is usually lighter than water, providing a bit of buoyancy. Sharks' main system of staying afloat is continuous swimming. Their stationary pectoral fins create a certain level of buoyancy when combined with forward movement. Because the sharks propel themselves with powerful tails, they can change depths faster than most bony fish that rely on releasing air from or adding air to swim bladders.